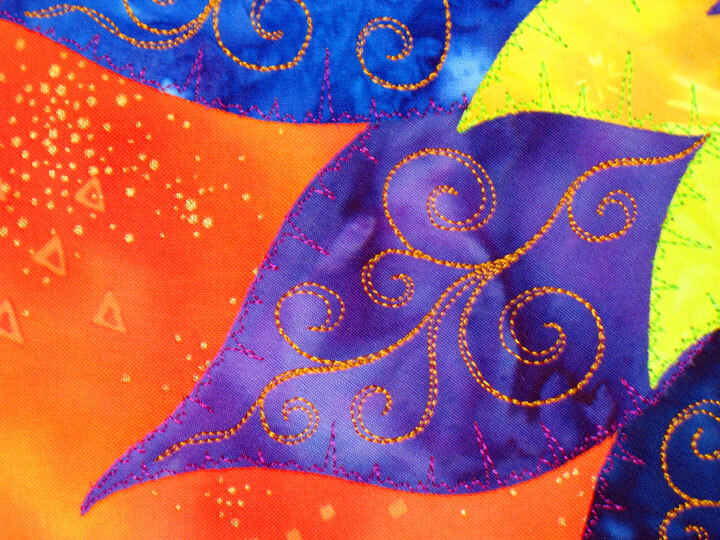 Congratulations go out to Jan Hood, who is the winner of the most recent fabric give-away! Thanks to everyone who played and I hope Jan can make something neat out of those fabrics that have been languishing on my shelves! So, at least for me, the key is to keep finding novel ways to use design elements that are already familiar to me. The curly-cue or swirl is a great example, because there are 20 million ways to reconfigure it. If you can even get 15 minutes of free time to play on a quilt sandwich that doesn’t matter to you, go for it! You’ll be surprised how much more creative you can be when you have no expectation for yourself! 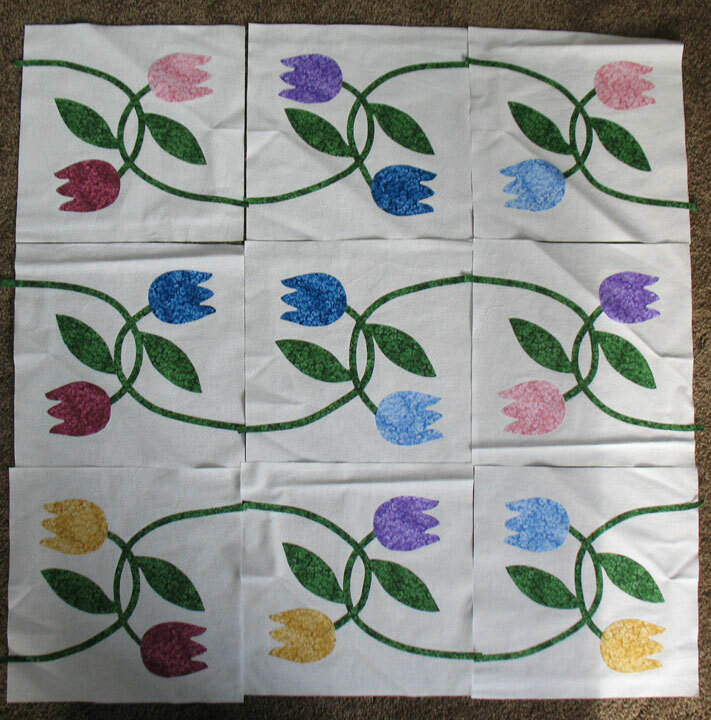 If you would like to piece this quilt (the blocks are in good shape; I just didn’t take the time to iron them before I took this photo), leave a comment to this post by 11:59 pm (eastern time) Saturday, Feb 5, 2011. I’ll pay shipping! 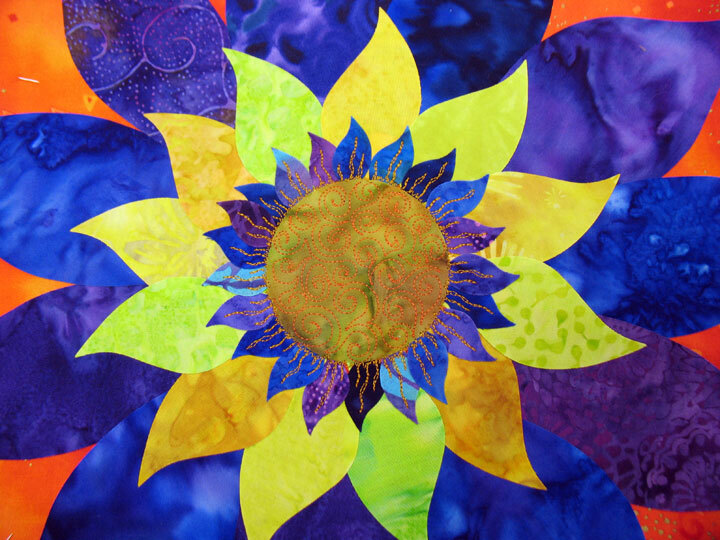 Drumroll, please…and the winner of the Poly Quilter Threads give way is Nanette Fleishman of Burnsville, NC! I actually know Nanette from the Fiber Arts Alliance group in Asheville, NC, so I know these threads are going to a great textile artist! Congratulations, Nanette! 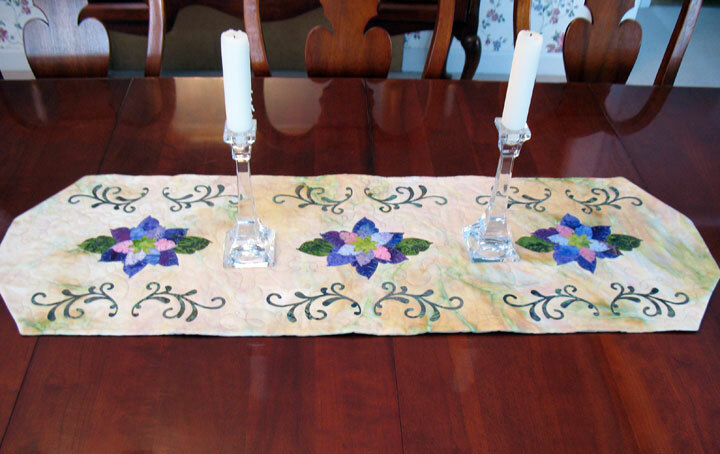 New Video Tutorial, New Table Runner Finished and Another Give-Away! 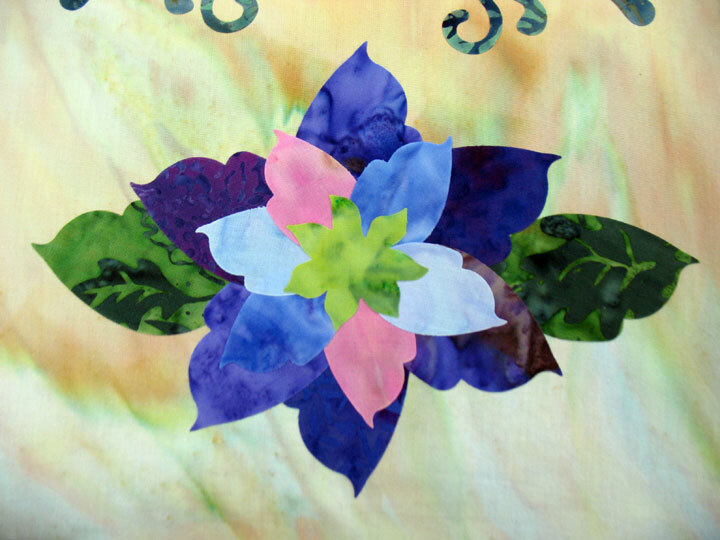 This table runner was created pretty quickly by cutting all the applique shapes on my Sizzix machine. 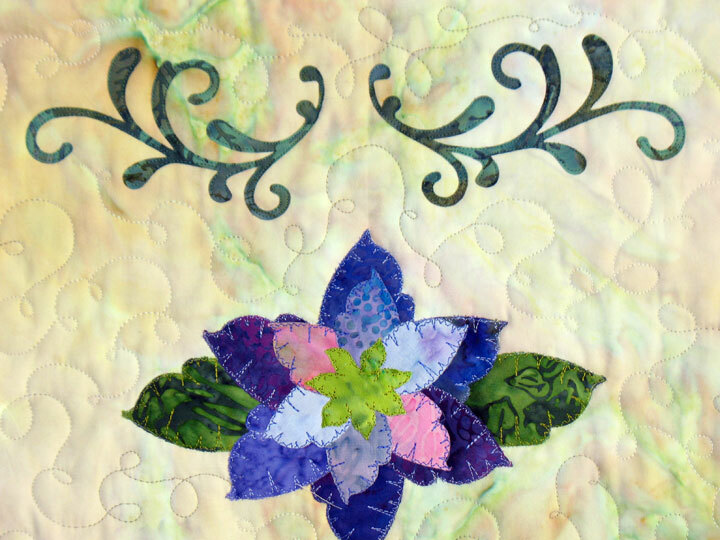 I used this project to illustrate how to cut applique shapes on our newest free video tutorial. You can find that tutorial here, on the homepage of our web site, and down the road, you’ll also be able to find it on the “free video tutorial page” by accessing the education tab on the homepage of the web site. 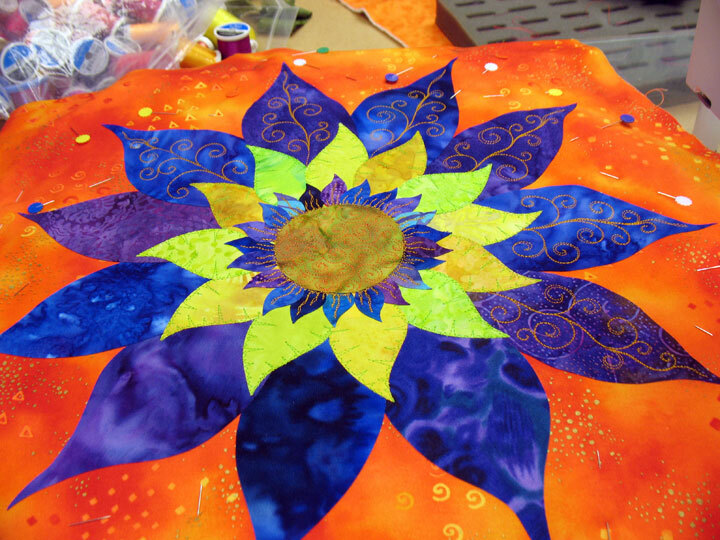 If you’ve ever wondered about how a fabric cutting machine might help you in your quilting endeavors, this tutorial will show you the ropes of how it’s helped me with applique. I never would have guessed it, but I have had more fun in the last few months appliqueing my brains out, and it’s all because of this little machine! 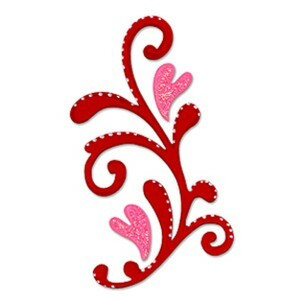 If you’re getting into doing applique with your Sizzix machine, we got some new dies in this week, and you can find them here. 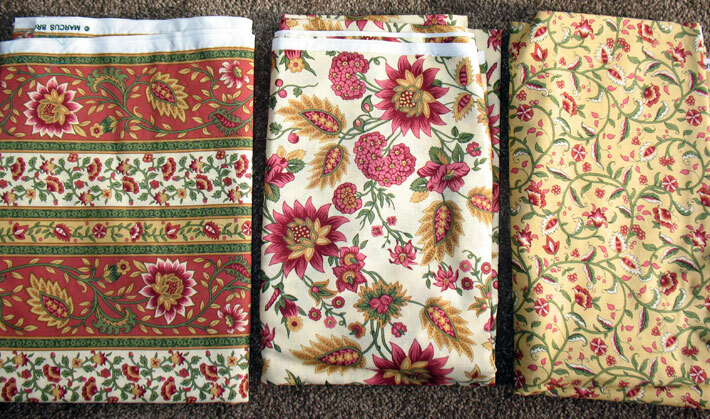 This is a border print with 2 companion fabrics. I didn’t measure it but I’m guessing there are 4 to 4 1/2 yards of fabric here, so a retail value of about $40. I’m going to ask that whoever wins this pays shipping, so if you’d like the fabric for free and will pay shipping, post a comment to this email and you’re enetred in the drawing. If no one wants it because no one wants to pay shipping, then I’ll give it away locally. Comments on this give away are open until Wed 1/26/11 at 11:59 pm. Good luck! The Mega Clean-Out Begins…and a Give-Away! I was going to begin this post with a “before” picture, but I just can’t. It’s just too embarrassing… WAY too embarrassing! 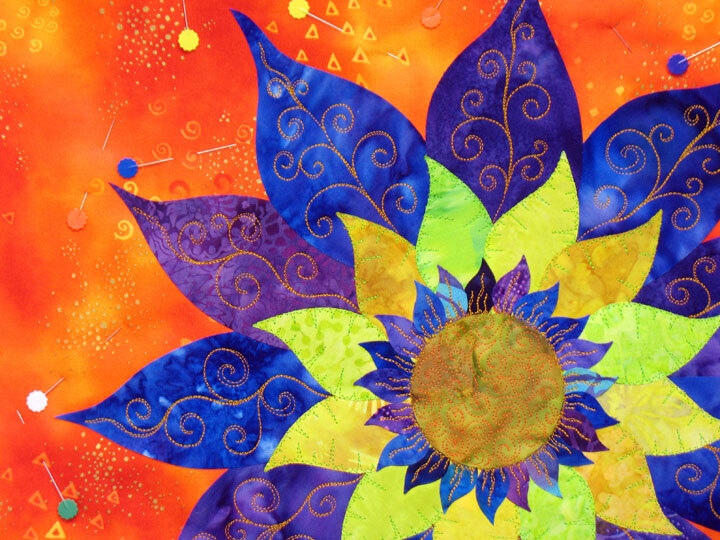 The truth is that, over the last few years, I have been traveling so much that my sewing room, then the entire second floor of our Ohio home, has been over-run by sewing and quilting STUFF. I have a habit of emptying my suitcases of all my quilting stuff, then turning around and re-packing for the next gig, and repeating it over an over and lots of stuff has just not been put away as it needs to be. It’s so over-run now that I can’t work efficiently at all in my sewing room as it currently exists. It’s a small room to begin with and it also functions as an office, but there is now so much stuff cluttering up that room that it takes forever just to clear a tiny spot on my cutting table to work. So, I have been plugging away this week and my goal is to get as much stuff as possible OUT OF MY HOUSE! I am giving 99.9% of it away locally, but I’m going to give away some stuff on my blog, just because it’s always fun to have a give-away! All you have to do to enter is to post a comment under the post that has something you’d like. Unless I state otherwise, I will even pay the shipping to get the item(s) to you! Keep checking this blog over the next several weeks because there’s an awful lot of stuff that I need to move! 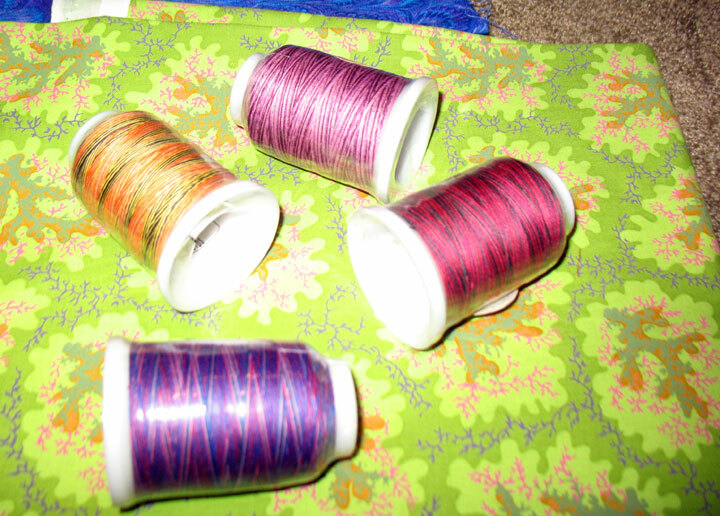 Each spool is 500 yards of a 19 wt spun poly thread with a cotton finish. Is there anything wrong with this thread? Nope! It’s just that I’ve got tons of variegated thread and I haven’t used this in all the years it’s been here so I want to make room for all the threads that I use all the time! If you’d like this thread, please make a post below and your name will be entered into the drawing. Comments are open until 11:59 PM eastern time on Saturday, 1/22/11. Good luck! 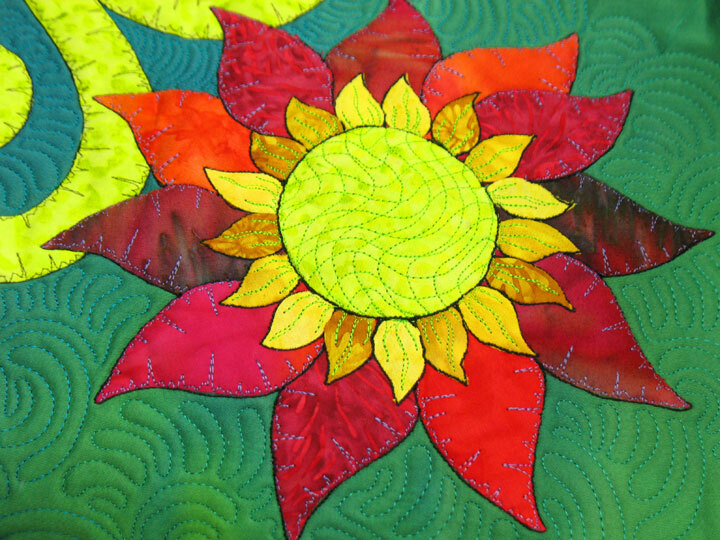 I notice you did not stitch anything around the edges of your first row of petals where you stitched the gold swervy lines. Would these be secure enough to withstand washing in a machine? 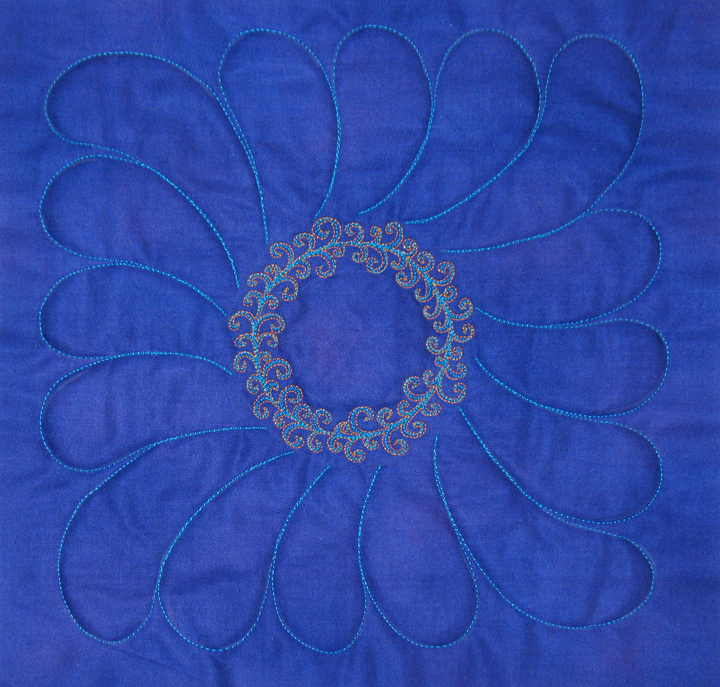 For this flower, I used a heavy solid black cotton thread to outline each individual piece. It makes each piece protrude out just a bit, but by using black thread, it also adds that cool, thin black line around everything. 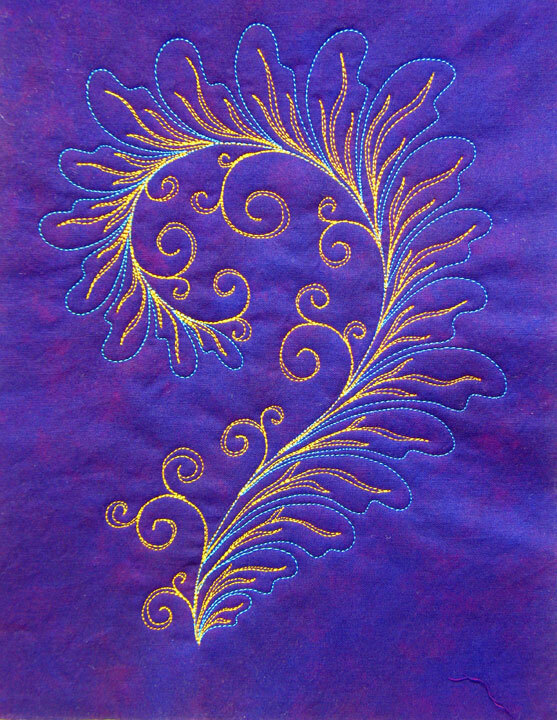 Another good example of how thread can really alter a piece! 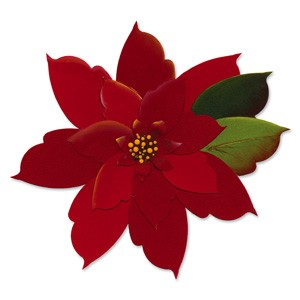 Beautiful background for your fantastic flower! I can’t remember if you mentioned this before but do you do free-motion when you do the zigzaggy edges or is that a special stitch on your machine? Always love seeing what you are working on! 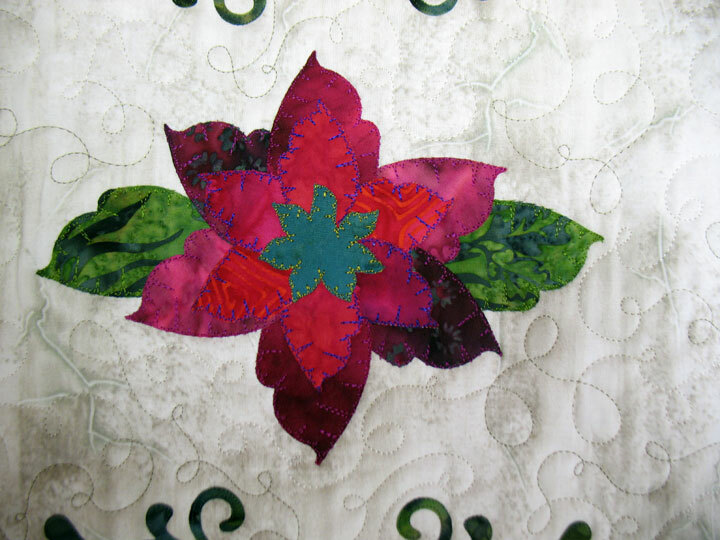 quilting/embroidery? I’ve noticed on some of your work and on others like Ricky T.
lets try something else? Thanks for sharing!!! The next step was to come up with a background fill design. Know that many, many background fill designs would work here. 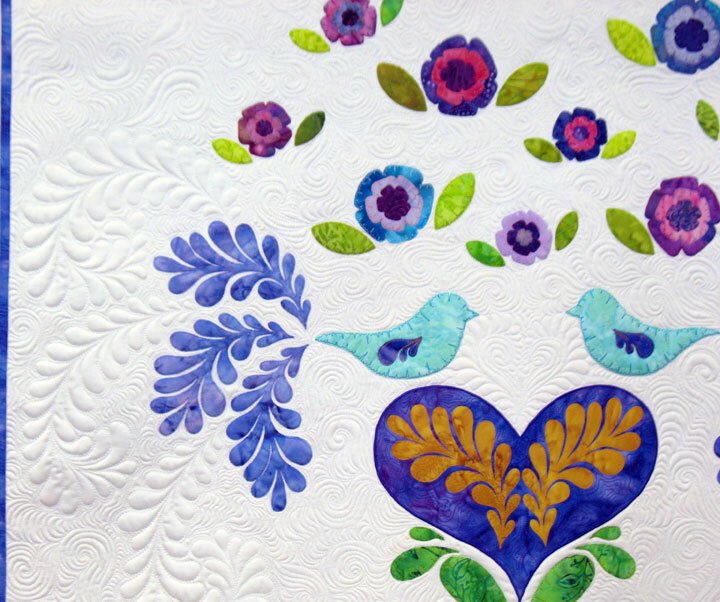 Because I was trying to get my biggest bang for my buck on those voluptuous feathers (both appliqued and quilted), I knew I wanted a fill design that was very curvaceous. 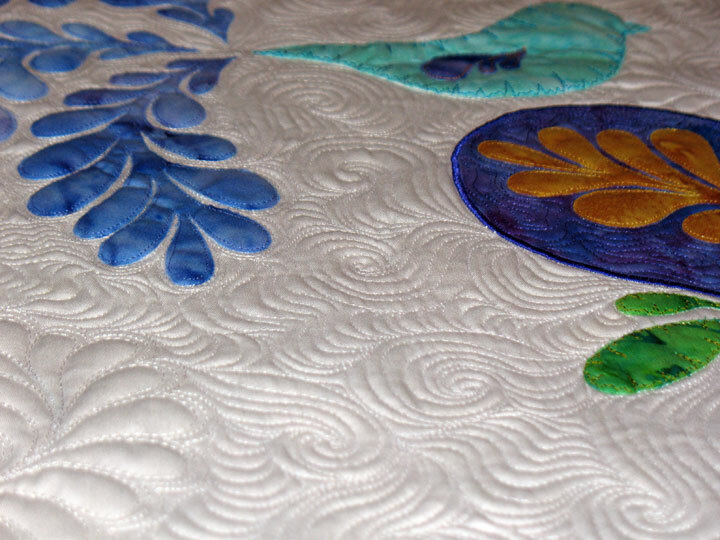 More curvaceousness meant adding a wonderful flowing sense to this quilt. Look again at the background in the photo above-do you see how your eye is just drawn to those swirls? Your eye wants to follow them, to make sense of them, so you are left with this wonderful sense of flowing movement. That background fill design is my version of McTavishing, except that I have placed a very heavy emphasis on the swirl portion of the design as this gives even more movement than my everyday McTavishing. Did I worry that this design would not work? No, I was certain it would work before I began stitching. (And by the way, this is such a dense background fill design that I wouldn’t have risked it if I hadn’t been sure ahead of time, as it would have been AWFUL to pull out!) How did I know that ahead of time? Because of all the reasons I laid out above, and I have learned these tricks simply by playing around with as many background fill designs as I can. 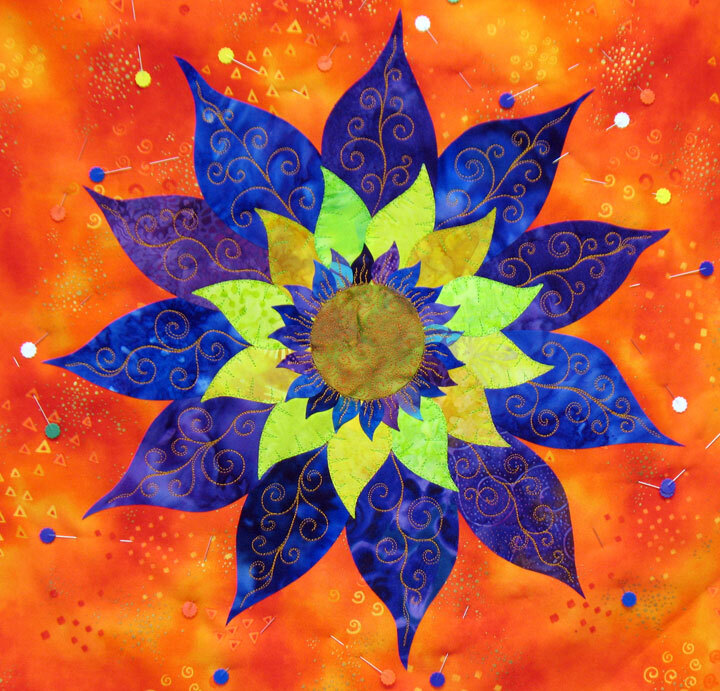 For me, deliberately trying many, many quilting designs on different quilts has really opened up my creativity. 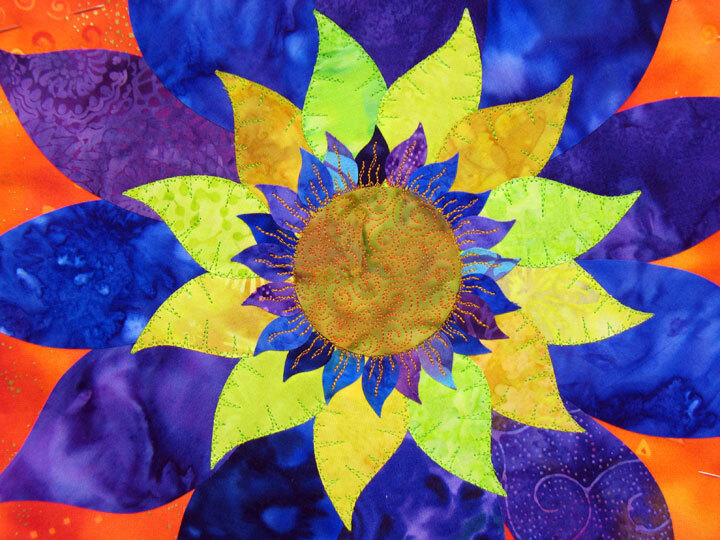 If you haven’t messed around in this way, you are missing out on a lot of fun, and your quilts will probably become more interesting if you take the time to experiment! Do you see how this almost looks like the frosting on a cake? This part was easy! 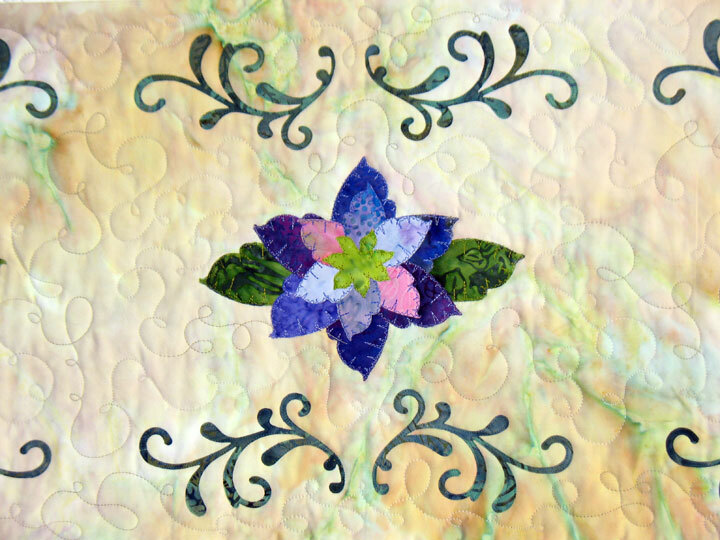 Instead of using a plain cotton fabric for the background, I used cotton sateen. 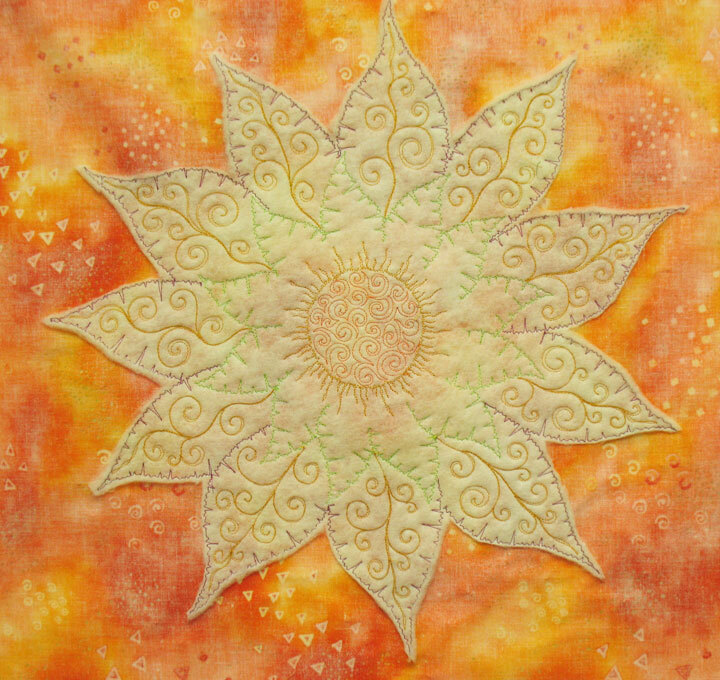 Sateen has just a hint of a luster to it, so when you quilt it, it throws of incredible shadows. 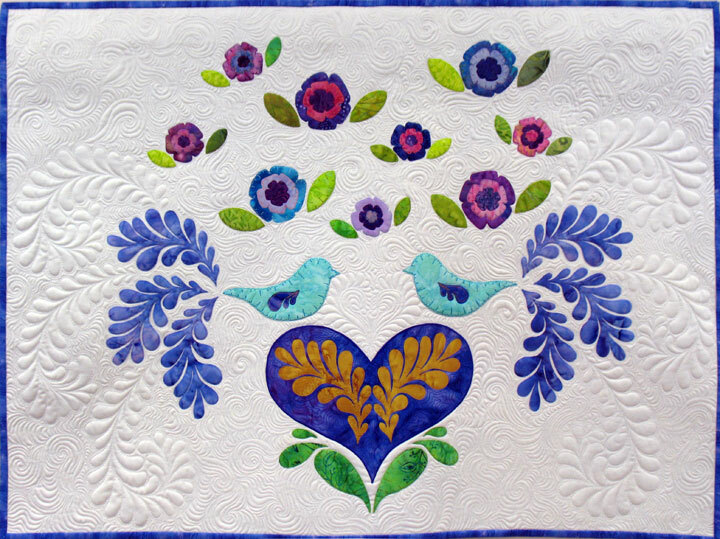 Because of that shadowing, your quilting adds an extra level of richness, kind of like going from a regular Oreo Cookie to a “Double Stuff Oreo Cookie,” and who doesn’t like that? !